"I am riding every weekend from 18 to 22 miles and now I average about 11 mph. The trike is great and I really enjoy riding it. I am in better health now and look forward to the next ride. Thank you for a good product." "My wife truly loves it. She was a college athlete who can hardly walk now, but the trike gives her a new sense of independence, and for that I thank you and your company!! Makes me feel good too. Aaron, an upper extremity amputee, on a 22 mile ride in Florida. "His doctor told him he'd never walk again. Well, he surpassed that expectation, although, he says, it takes him about 20 minutes to walk across the rooms in his house. Within minutes of mounting the MonoMano [Tricycle], however, he was 100 yards down the bike path, and not coming back! To feel the wind, to feel like he was getting somewhere so effortlessly, and so independently, was amazingly freeing!" "To see my son riding around the lake with his cousin and enjoying the outdoors has brought us much happiness. Not only does the bike allow my son to ride with me and his cousin, but it also serves as another form of exercise to keep him healthy. I've enjoyed riding with my son and seeing his smile leaves me speechless. 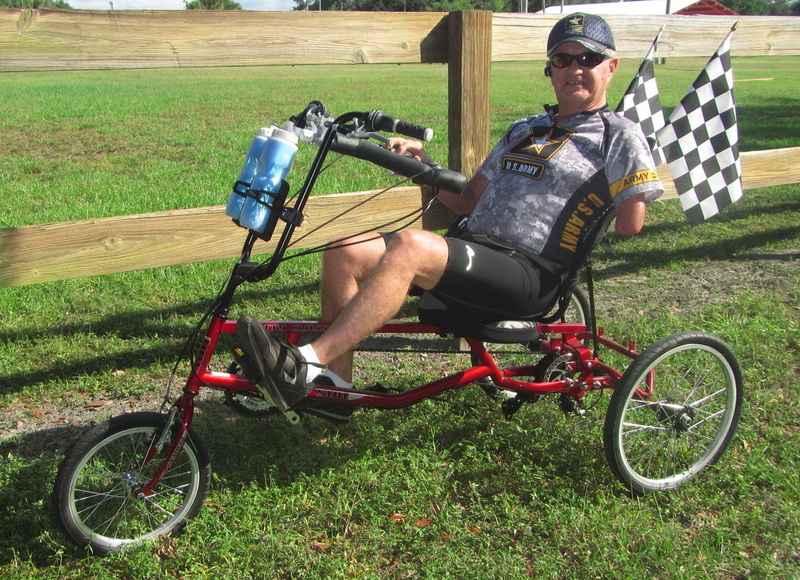 I would strongly recommend the adaptive bicycle to anyone that would benefit from it." "I know a lot of people will benefit from your bike; it could be a great way to get them out and about! ... I have been talking with my husband about how much fun it is ... Several neighbors walked over and were talking about how they were excited to see him out and can't wait to go for bike rides with him."